Both Illinois and the federal government prohibit the possession of a firearm by those who have a previous felony conviction. This restriction also applies to those who have been convicted of domestic violence as well as persons who currently have a restraining order against them. Regardless of whether you feel you should have the right to a gun, the law’s prohibition is clear. Violating these restrictions can result in prison time, fines, and other penalties. It is important to understand that you have options in these situations. I am a Peoria criminal defense attorney who handles cases where felons or other persons have been in illegal possession of a firearm. If you need to speak with a lawyer then call today to schedule an initial consultation. It is illegal to posses a firearm if one is a convicted felon, has been convicted of domestic violence, or if they have a restraining order against them. In addition to violating state law, possession can lead to federal criminal charges under 18 U.S.C. 922(g). Being charged by the U.S. Government can result in a defendant being punished under the Federal Sentencing Guidelines. If the gun was used during the commission of another violent offense then additional charges will also be brought. How the case proceeds will depend on whether the accused is charged in State Court or Federal Court. In the federal system the United States Attorney will first gain an Indictment from the Grand Jury. A trial date will be set after a “not guilty” plea is entered. Many felon in possession of a firearm cases hinge on whether law enforcement, whether it be local police or the F.B.I., found the gun through violations of the Fourth Amendment. If it is shown that the gun was only discovered due to an illegal seizure then it is possible to exclude the weapon from evidence. This would likely result in a dismissal. If the case cannot be dismissed then it may be necessary to go to trial. It is vital that you retain an attorney who is familiar with this process. I am a Peoria criminal defense lawyer representing those accused of being a felon in possession of a firearm. I will use your initial consultation to hear your side of the story, to learn how the gun was obtained, and to help you understand what to expect from the process. I will quickly obtain all police reports, witness statements, and other evidence in the case. If your right against an unreasonable search and seizure was violated then I will file a Motion to Suppress the evidence. I will aggressively question law enforcement at an evidentiary hearing and will not hesitate to take your case to trial if necessary. I am a licensed attorney in both Illinois and Federal Court. Contact my firm today. In addition to Peoria, I service the cities of Bloomington, Eureka, Galesburg, Morton, Normal, Pekin, Springfield, and Washington. We also serve the counties of Fulton, Knox, LaSalle, Marshall, Mason, McLean, Putnam, Rock Island, Schuyler, Stark, Tazewell, and Woodford. I also handle federal cases in Urbana. 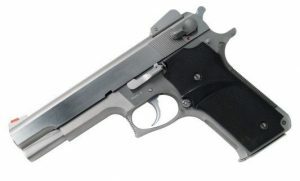 Penalties for firearm related offenses can be severe. They can be even worse if the gun was possessed illegally. It is important that you retain counsel familiar with such matters. I am a former prosecuting attorney with over twenty years of legal experience. I am familiar with the local court systems and will know what to expect in such situations. I also place a high value on attorney-client communication. I regularly provide clients with my cell phone number, can be reached via text message, and I make myself available to answer any questions you may have. My firm understands the gravity of your situation and is here to help.